St Mary Magdalene was born into one of the wealthiest and most noble families in Florence, Italy. 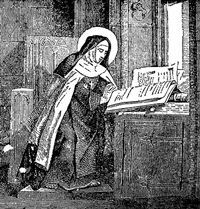 In her youth, her devotion to prayer and penance was implicit in her everyday behaviour. At the early age of 10, she was allowed to receive her First Holy Communion. At the age of 12, she had her first ‘mystical’ experience. At 14, she transferred to a convent school and at 17, she was received as a novice of the Carmelite Order in Florence. About a year later St Mary Magdalene became seriously ill and arrangements were made for her to make her final vows. During the service, she had another mystical experience which lasted two hours and was repeated every day after Communion for the next forty days. Her Superiors arranged to have her experiences documented to avoid claims of deception or controversy. St Mary Magdalene’s experiences continued for much of her short life but were interrupted by periods of great temptations. Her Feast Day is the 25th May, the anniversary of the date of her death. Pray for us that we resist the temptations of satan and remain in the protective love of our Risen Jesus.